Is the UK a democracy if its government was only voted for by 24 % of the population? Is it fair that 50% of votes in the 2015 general election went to losing candidates, giving their casters no say? Can it be considered right and just that the number of votes per MP elected was 3,881,129 for UKIP, but a mere 25,972 for the SNP? 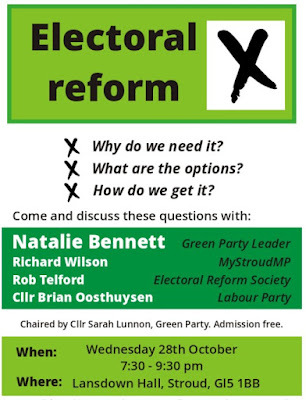 On 28th October, Stroud Green Party will holding be a public meeting to discuss electoral reform: why we need it, what the options are, and what we can do to bring it about. The headline speaker will be Green Party leader Natalie Bennett, who has campaigned strongly for the introduction of a proportional voting system. 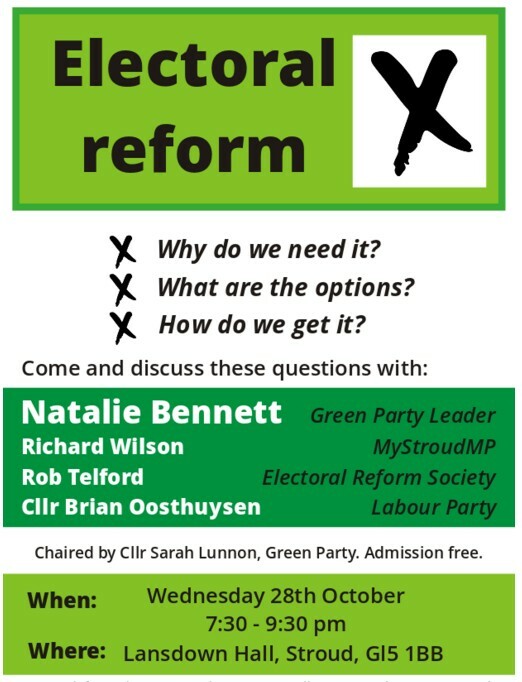 Joining her will be Electoral Reform Society Council member Robert Telford, MyStroudMP general election candidate Richard Wilson and Labour County Councillor for Rodborough Brian Oosthuysen. I note that these blogs entries may not be the views of the Green Party, but could be considered campaign material during an election. It must therefore be noted they are printed by, promoted by and on behalf of the Stroud District Green Party, 2 The Laurels, Bread Street, Ruscombe, Stroud, Gloucestershire, GL6 6EL.